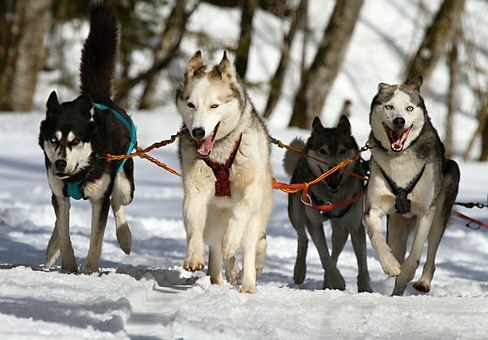 Siberian Husky is a breed originally bred to pull sleds in Nordic climates. Like all breeds, they have their own distinct traits that make them both challenging and exciting. While no specific breed is inherently more difficult to manage than others, various traits that Siberian Husky’s have might make managing them more challenging if your specific lifestyle doesn’t align with your dogs. Below, we will be going over some of the things that might make this breed more difficult to manage. One of the biggest problems that dog owners run into is exercise requirements. This is particularly true with the Siberian Husky breed because they were specifically bred to utilize a lot of energy by pulling a heavy sled for miles and miles without tiring. Because of this inherent characteristic, huskies can become much more destructive if kept indoors without sufficient exercise. Thus, if you are someone that enjoys running long distances and being outdoors, this is much more likely to be a compatible breed than someone that loves staying indoors and who avoids exercise. Another common trait that can really make them difficult to manage is their coats. Because they have a double coat made up of very soft and fine hairs, they are going to be shedding constantly. Unlike breeds that only feature a single coat, a husky is going to have hair fall out in large clumps which can make cleaning tedious. To make things worse, their hair tends to stick to everything from clothing to furniture. Thus, they have to be brushed and groomed consistently in order to minimize shedding. Those that cannot stand having random hairs around their home are going to want to avoid this breed entirely. 3. Prone To Getting Lonely. Another common trait that might make a husky difficult to manage is their inherent loneliness when they are not surrounded by other people or dogs. Because they were bred to work cooperatively with both other dogs and humans, they enjoy being around others. Thus, if you are a household that doesn’t have anyone home throughout each day, a husky is not likely to be happy and can actually get bored which can lead to destructive behavior or even resort to howling which can be troublesome for those with neighbors close by. Overall, a Siberian Husky is only difficult to manage if your lifestyle does not properly align with the breed’s inherent behaviors and characteristics.